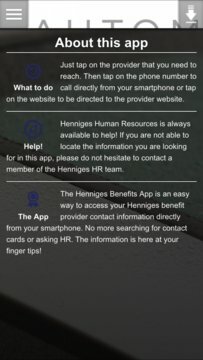 The Henniges Automotive Benefits App is a quick, easy way to access information for Henniges Automotive benefit carriers. The App serves as a paperless wallet card to find benefit coverage and contact information. The App also provides registration and enrollment instructions for various benefit carrier websites.